Dear “Hyperborea Exists” followers, another week I’m with you with my lesson about the history of Nordic Mythology. Today, at last, we begin my favorite part of this series of updates, speaking of the most important Nordic gods and, of course, Odin, the Great Father, is the chosen one to start this series of updates which will trigger the end of this cycle in “Hyperborea Exists”. The god Odin was the most popular of the Germanic gods during the first millennia of the Christian era. Known as Woden by the Anglo-Saxons, Wodan by the German and Saxon tribes and by the Long bards (?) as Godan, he was considered as the mythical ancestor of most Germanic tribes, as well as of some early Middle Age royal Anglo-Saxon families. In fact, if we take a look at the present day, the word “Wednesday” comes from Odin (Woden). 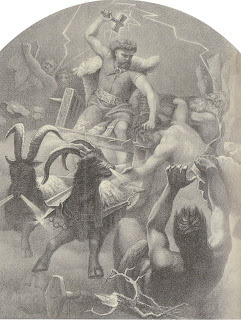 Thor fights against the Jotun, by Martes Winge (1825-1896). Thor leads the fight against the giants (the Jotun). Echoes of thunder accompany the cart, driven by magic goats. He uses his Belt of Strength and often he wears iron gauntlets on his wrists which allow him to use his hammer. In spite of this, he was long before considered as a god of healing, magic, runes and knowledge, and also as the god of death, war and destiny, but on top he was known as the great father of the Nordic gods. Anyways, his followers also knew of the ambiguities of this god, because they knew that in the battle he could lead those who worshipped him to victory or death. The poem Hávamál, from Iceland, which as was written wasn’t picked up until the XII century, along with the “Edda in prose” from the XIII century, bring us a poetic although powerful version of how the god Odin became the first to acquire the knowledge of the runes, that is to say, with the power and use of writing. In both works, Odin himself speaks and declares that he got the runes hanging from <>. As a result of these nine days of fasting, he learned the nature of the runes better. 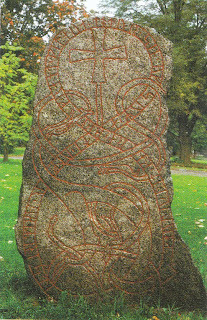 Rune, Uppsala, s. XI, by Gamlta Torget. Germanic mythology gave great valor to the writing, which was runic. This knowledge was acquired with suffering. Odin, father of the gods, suffered nine days of fasting and pain to reach is knowledge. This episode, known as the self-sacrifice of Odin, is similar, although only on the surface, to Christ’s sacrifice, by having remained hung and also by the wound of the spear. According to some, this could suggest an early adoption of the main Christian myth by the ancient Nordics, maybe through the British islands. Despite this, numerous similar forms of sacrifice in the initiation in numerous archaic cultures can be found. Its origin might be linked with more clarity to the shamanistic initiation rites in the learning of poetry and magic. Viking stone engraving found in Gotland, Sweden, s. VIII. This stone represents the god Odin (Wodan) assisted by the Valkyries, on his eight-legged hose Sleipnir, the most magnificent of all horses. He is the one who takes the brave fallen to Valhalla. Germanic tribes had an alphabet made up by 24 “letters” called runes. The most antique findings of runic inscriptions come theoretically from the II century, I mean theoretically because it’s possible that they were being used from long before that (and more with special attention to investigations which will be published this year). Since the Germanic people didn’t know the scroll, the runes were carved in wood, stone and bone, which could explain its angular form. They can also be found in ornaments, swords, armors and coins. 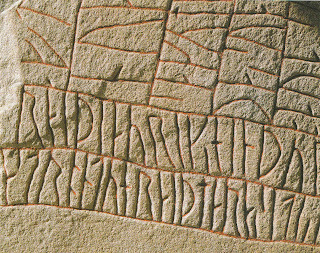 Runic stone found in Rok, Sweden, IX century. This stone was carved by Varin as a memorial of his dead son Vemod and contains an ode to Theodoric, King of the Goths. The runs have a meaning by themselves, combined and following a certain order. In the myths, eighteen runes were revealed to Odin. It’s been suggested that the Runes could have evolved from the Latin tongue after contact with the Romans, but there is no proof of that. The word “rune” means “mystery” or “secret” in old Nordic, and that’s why it has been associated often with magic, along with profane and religious purposes. With this explanation finishes today’s update, which I hope has been useful to you in knowing Odin and the Nordic runes. In the next “Hyperborea Exists” update, I will focus myself in telling you one of the most fascinating tales about Odin and the Nordic gods: The myth of the honey mead. See you soon, “Hyperborea Exists” followers! mythology of every culture in the world.